In a natural wonderland in northwestern Arkansas, the Buffalo National Scenic River runs through picturesque terrain that serves as a home to a number of endangered species, including the Gray Bat. But now, a massive hog factory poses an ecosystem and health challenge, threatening the well-being of local fish and wildlife. The free-flowing Buffalo River and the surrounding land is cherished by wildlife watchers, anglers and canoers alike. The river runs through woodlands, awe-inspiring bluffs, and hollows for 135 miles as it flows eastward through protected wilderness as America’s first national scenic river. Four species under the Endangered Species Act call this area home. The river is an extraordinary area for wildlife watching—fifty different mammal species can be found in the area. While hiking or canoeing, you may spot a black bear in the woods or view a mountain lion traversing a variety of habitat. You may see Elk relaxing under shade trees along the river in the summer. Evidence of other large mammals such as bobcats and coyotes can also be found. Reintroduction of the black bear to this area has made sightings more common. Photo: Steve Perry, location unknown. Creating a massive hog factory within the Buffalo River’s headwaters is a bad idea, but that is exactly what some government agencies allowed several years ago. Due to limited public notice during the permit approval process, county residents and National Parks Service (NPS) employees were not notified about the permit request thus missing their only opportunity to comment on the disastrous impacts this large hog factory might have on the river. Now, a 6,500 hog facility sits only a 100 feet in some places from Big Creek, a major tributary in the Buffalo River headwaters. Many residents will tell you that family farms are welcomed in the county, and then reassure you that this massive hog operation is not one of those. Recently, a federal judge declared that the Farm Service Agency and the Small Business Administration violated laws protecting natural resources by authorizing this facility. The agencies were forced to do a draft environmental assessment that is disappointingly flawed. Their report concluded the facility will have no impact on water resources. There is no impact from a hog operation that creates more than 2 million gallons of waste each year? Interestingly, data from the study they used for their assessment found rising nitrate levels downstream from the facility and an increase in E. coli at their well, the trenches and an ephemeral stream nearby the facility’s field. Monitoring by the National Park Service (NPS) agrees, noting that E. coli was found at the confluence of Big Creek and Buffalo River. The NPS also found low dissolved oxygen (DO) levels at the confluence, likely a result of algae feeding on the nitrates. This spells trouble for fish and other inhabitants who depend on the river. The placement of the facility is a direct threat to the scenic river’s water quality and all who depend upon and enjoy it. Sitting near the stream, the operation also poses a serious risk to the river system during major floods. 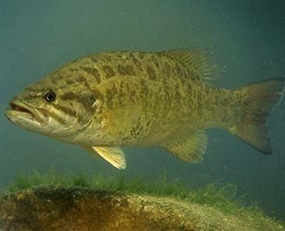 Reduced oxygen levels may impact fish populations in the upper Buffalo River such as smallmouth bass, perch, catfish and other aquatic life in the river. The endangered Gray bat lives year-round in the limestone caves in the area. While the species struggles for survival, a fatal disease known as white-nose syndrome is now jeopardizing bats in the area. To add insult to injury, their primary diet is aquatic insects such as mayflies and caddisflies that are highly sensitive to polluted waters. Losing their main food source could be a double-whammy for the endangered Gray bat. Water contamination is also a threat to human health. NPS’s unwelcomed discovery of E. coli downstream is not surprising though. The facility and the permitting government agencies failed to acknowledge one simple fact that this facility is on a type of land called karst that is common in this area. The porous rock below allows pollutants to easily seep into the water supply. Many of the citizens depend on well water in their homes that is now jeopardized by this facility. Needless to say, nobody wants to swim or canoe either when E. coli is in the river, so it may take a toll on the recreational industry that generates much needed revenue for this region. River otters won’t get much of a choice though. Beyond water pollution, there is also a number of impacts that the flawed government report ignored or underplayed such as the health impacts from decreased air quality emitted by 2 million gallons of waste each year. Studies have shown that these massive facilities take a toll on the health of facility workers and nearby residents. What will happen to wildlife adjacent to this property? This is not about theoretical impacts before a project begins though. The facility was allowed to start running without much scrutiny, and now scientific evidence is building against the facility. The fact that the recent court-mandated assessment ignores proof of water and air pollution is unacceptable. The 6,500 hog factory at the headwaters of the Buffalo National Scenic River poses a threat to the health of fish, wildlife and humans as it contaminates the water and the air. This is not the first controversial battle to protect the river, and we hope citizens will speak up again to protect America’s first national river. Let the agencies that permitted this facility know that you reject their claim of zero impact on the ecosystem. Update: Thank you to everyone who submitted comments to protect America’s first national scenic river. Comment period is closed, but we will keep you posted on this important conservation issue.